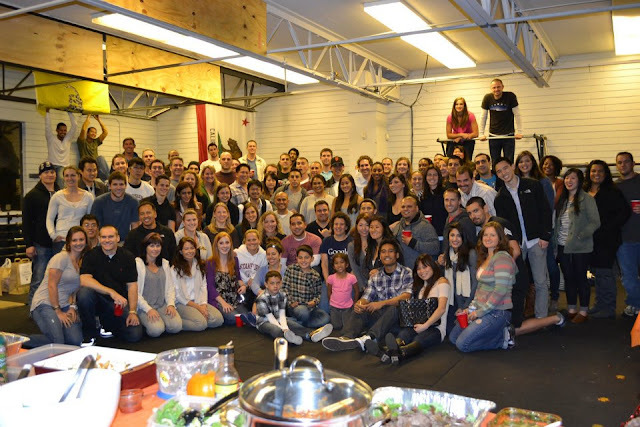 KI Athletics' Thanksgiving Paleo Potluck! Last Friday was KI Athletics' first annual Thanksgiving Potluck and Canned Foods Drive. I was super excited since it's been awhile since we had one of these events and because I love Thanksgiving food! I had a great time catching up with people and meeting other members. There was really good turnout from both gyms and tons of delicious food, even for people who came late! Stuffing has always been one of my favorite Thanksgiving dishes. However, the dish is basically all bread seasoned with herbs and hence totally not Paleo and full of gluten. In spirit of the Thanksgiving Potluck at CrossFit Santa Clara today, and my determination to convince my boyfriend's parents that low carb dishes can be delicious, I have been experimenting with making Paleo-friendly Thanksgiving stuffing. I think I found the perfect recipe, thanks to Mickey and Alex for sampling in exchange for feedback... and it does not include chili peppers! Check out my latest Thanksgiving dish creation: Roasted Parsnip and Pear Soup and Scalloped Root Vegetables! While in LA last weekend, I made some time early Saturday morning to get a WOD in at CrossFit Los Angeles in Santa Monica, CA. I chose to come here since CFLA is the closest CrossFit gym to Westwood, Shirley and Alyssa from Sweet Cheeks workout here, and because I wanted to check out a box that participated in the CrossFit Games this year. At the games, I sat across from CFLA folks in matching baby blue jerseys. I remember all of them cheering at the top of their lungs, especially during the team rope climb WOD. Conveniently, CFLA is also the closest CrossFit gym to Westwood, where I stayed. Last weekend I took a trip down to LA to visit Eugene. While in town, I made time to get a WOD in at Valley CrossFit since I had such a blast last time! My expectations were exceeded! They are still one of my favorite boxes to visit ever. Two recipes in one. 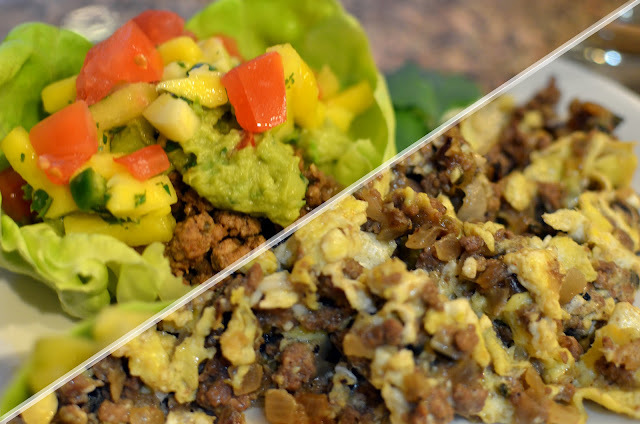 Beefy Lettuce Tacos for lunch and Beefy Eggs for breakfast! I love to go to the Farmer's Market on Sunday's to buy Thai chili peppers and to load up on food for the week. I also go to sample all the fruit in season from different farms. Last Sunday a farm brought in a large variety of apples. The apples were so good!!! I really wanted to get some, but I did not want to end up eating like five apples a day so I quickly started brainstorming what recipes I could make with apples. Luckily, I ran into Sally who gave me the idea to make an apple salad with arugula. While shopping for arugula, I noticed that the farm had all different kinds of spinach for sale. One of the owners was nice enough to explain the differences between all the spinach. The one I liked the most was this purple spinach called Orach because it had this natural salty flavor. Viola, I knew what I was going to make for dinner: a dressing-less salad with ingredients so full of flavor that they can be eaten plain... and all the ingredients would be from the Farmer's market! My favorite nuts-to-go packets to get are Oren's Kitchen Smoked Paprika Pecans at Whole Foods. However, since they stopped selling them... or maybe I just can't find them anymore, I decided to try to make them on my own using the same ingredients except instead of olive oil, I used macadamia nut oil. I don't have any olive oil. After a few attempts, playing with the way I added salt, mixing the spices, and using paprika vs. smoked paprika, I finally found a recipe that taste almost exactly identical to Oren's.. but a little spicier and fresh! Ever since I injured my hand a few weeks ago (and since I started being more patient with the healing process), I have been doing a ton of leg work. With the injury, I have a hard time securing the grip and doing any backward motions with my hand. I cannot do any shoulder-to-overhead movements, jerks, KBS, wall balls, front squats, overhead squats, muscle-ups, cleans, and snatches. :(. So you know what that means?! Until it heals, leg work all morning, every day baby. Carb, Fat, Protein breakdown sample. I had a few request for a picture blog post on what I eat on a normal day, similar to what I did for binge day. I have been on the Paleo (no grains, refined sugar, soy, legumes, gluten, and dairy) diet for three months. Three-year anniversary dinner at Manresa! 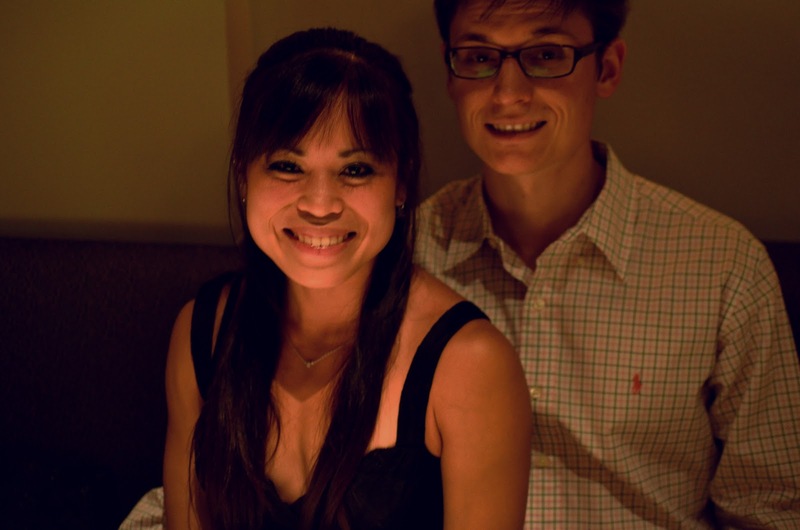 Yesterday, Eugene and I celebrated our three year anniversary at Manresa Restaurant in Los Gatos, CA. We decided to splurge a little bit to experience dining at a two Michelin star restaurant and molecular gastronomy at its best. For those of you in the Bay Area with a special occasion to celebrate, we highly recommend Manresa! All their ingredients are seasonal and local. Everything was top notch, from food quality to service to decor! 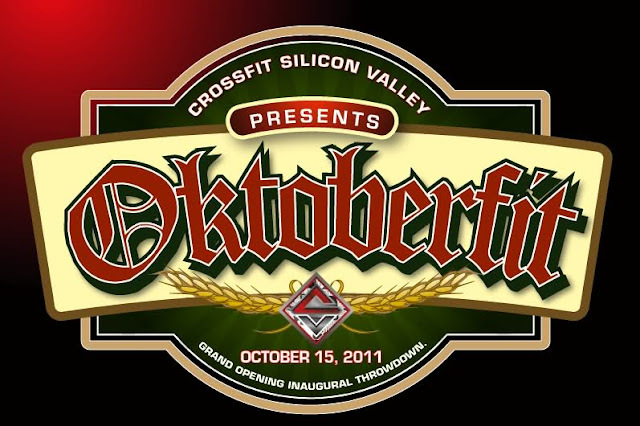 OktoberFit at CrossFit Silicon Valley! Last Saturday, CrossFit Silicon Valley held OktoberFit, their grand opening inaugural throwdown for boxes nearby. Everyone was invited! Watching is free, but it costed $10 for all-you-can-consume beer and food. Teams of three, with at least one female competed in four WODs in four hours, as RX or scaled. The top five RX teams went on to the final showdown. The event was sweet and very well coordinated. It had sponsorers, photographers, a DJ, live entertainment, and of course, tons of beer and food! KI Athletics had around 10 teams participate!! There were prizes for the top three Rx teams, and also for the best dressed team. Where else can you watch beer cans and super heroes WOD? Skye and the rarely visible, Molokai!! Taken from the Mariner's Ridge Hike on a super clear day. The most dear trail to my family and I is the Mariner's Ridge (Kaluanui) trail to the top of the Ko'olau Mountains in Hawaii Kai, Oahu. The trail is about 3 miles round trip (~1.5 hours with pictures) with tons of photo opportunities! At the top, there is an amazing view of windward Oahu and Kaneohe Bay, in addition to you know, Koko Crater, Koko Head, Hanauma Bay, Diamond Head, east Oahu, and the beautiful mountain range of course. The hike is pretty easy, as it can be done in slippers. We also like it because it has a lot variation from rock climbing to hiking to different mountains! Skinny Fat (January 2008) vs. Fit (September 2011) vs. Twig (May 2010). 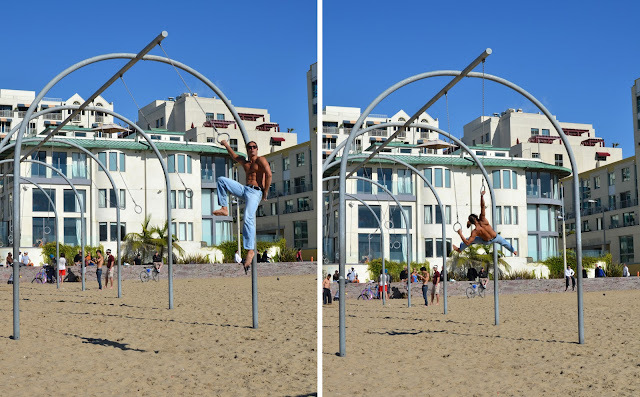 Lately, I have been frequently asked about my CrossFit beginnings. How did I get started, did I have any fitness background beforehand, how often did I go, do I have before and after pictures, etc. So this post will be about how I started CrossFit and why I stuck to it. Lately I have been really busy at work and with moving. I workout, go to work, sleep, and repeat the cycle. I choose not to cook anything that would take more than 30 minutes since I rather use that time to sleep. But I still want to eat Paleo and have some food variety throughout the day. There is only so much takeout Mexican food I can eat before totally getting sick of it. The other problem with eating out is they don't give you enough meat and the meat quality is probably not the best. One day when I was driving home from work, I was brainstorming quick recipe ideas I can make with some of the pre-chopped food at Whole Foods. Since most of my cooking time is spent prepping, I might as well try to minimize that. So for the busy, the lazy, the picky, or all, this recipe is for you. It takes 30 minutes to make, absolute max. The base is minced seasoned ground beef that can be used for at least two of your meals during the day, depending on your appetite. Beefy eggs in the AM, and lettuce tacos for lunch! The two dishes have a great balance of protein, fats, and carbs, while maintaining variety. Recently, I started to come in early to do supplement work, specifically to do some back squats! I am really trying to increase my numbers, and I figured focusing on the squat would be a good start. The 20-Rep Back Squat program is "the brutal path to massive gains." The idea is to perform 20 unbroken back squats in a single go. One way to select the starting weight is to use one's current 10RM or 70-80% of one's 1RM. For every successful set, add 5 to 10#. Or if it's too way too easy, add 20# (Mickey!). You should be able to get at least 10 reps in, or you went up too much. Do this 1-2 times/week for 6-8 weeks. Most people can reasonably expect to squat their 5RM for 20 by the end. My dad at the top of the Koko Head Crater trail... in VFFs! This post is dedicated to my dad, as this post is just as much about him as it is about the hike. His favorite metabolic conditioning exercise is to sprint up and down the Koko Crater (Koko Head Crater) hike for time (yea, CrossFit!). The Koko Head Crater trail is an old, abandoned World War II inclined railway of approximately 1000 steps, maybe more, one-way. The railroad was once used by the military to transport supplies to a lookout shelter at the top. Hikers use the old wooden railroad ties as steps. The hike starts off relatively flat with the steps. About 1/3 of the way there is an old railway track bridge hikers have to cross to continue. Many people fear this bridge, especially when going down. After crossing the bridge, the hike quickly gets steep, and remains steep until you reach the top. A few of the many spectacular views off of the trail consist of: Hanauma Bay, Koko Head, Hawaii Kai, Diamond Head, and the Waikiki skyline. Also, Koko Crater is Hawaii's tallest tuff ring (~1200 ft), created from the last active volcano that occurred on Oahu approximately 10,000 years ago. Now for the locals, if you hiked this trail, you probably saw, met, or heard about my father. My dad is that "crazy-fast, inspirational," "Daisy's Dad/old guy/old man/grandfather/grandpa," with the cute "dogs/Daisy/Goldens/3 dogs/2 dogs", and the "grand son/daughter" lagging behind (referring to my brother and I), people on the trail always talk about. Also in that order, haha. Daisy has also been compared to a "mountain goat" and "lion." My dad and our dogs made some publicity over the years. They were featured in the local news, newspapers, websites, and probably in your photos, too. My Paleo twist on the Chinese-style fried rice! A fast and simple recipe to make use of leftover veggies and meat. Eat it as a meal, or as a side. This dish is full of flavor either way! 6am party crew at Foundation CrossFit! While in Seattle to spend quality time with my family before my brother, David starts college, I figured it would be appropriate to visit Foundation CrossFit, the nearest CrossFit box to Seattle University in Capitol Hill! I joined the 6am party on Monday, my last day in Seattle. This was my first 6am class ever (my options were 6am or no CrossFit for the day)! I did not plan on participating in Fight Gone Bad 6 last Saturday because of my impromptu trip to Seattle (though I did originally registered to do it at CFSC/MV). When my parents told me my arrival time in Seattle conflicted with my brother's scheduled move-in time, I considered otherwise. I have already been to Seattle and done all the touristy things. My flight got in quite early. I asked my friend to pick me up, but he's notorious for waking up late. Since my parents were not able to pick me up from the airport and since I wanted to give Devon some extra sleep time, I decided to do FGB at the nearest CrossFit box to the airport! Right upon arrival at the Seattle-Tacoma airport, I caught a cab to King CrossFit in Renton, WA. I made it just in time for the 9am FGB heat! Best of luck to my brother David who just started college at Seattle University! I was in Seattle this weekend to join my parents in sending my brother, David off to college! He will be majoring in Computer Science, class of 2015. Jack, Danyelle and I at their home gym! I did my first CrossFit class at Fitness Gone Bad around New Year 2011, as a part of the Lululemon Athletica 31-days of Fitness Challenge in Hawaii. So you know, of course I had to visit them when I was in town again! Back to the roots! Super exciting!! 9am Labor Day Crew at CrossFit 808! Next up was Elyse Umeda's gym, CrossFit 808, in Kalihi. I was super excited to come here since Elyse is one of my favorite CrossFit all-stars! I emailed Elyse my intention to visit and signed up for the 9am class on Labor Day. When I arrived, I was immediately greeted by Elyse and a few members who were hanging out outside. As I walked into CF808, it reminded me of the Nasty Girls video because it kind of looks like "the original" CrossFit. One of the reasons why I started CrossFit was because of that video. 31 Heroes crew at Hardass Fitness / CrossFit Hawaii! I believe all the boxes on Oahu participated in the 31 Heroes WOD on Saturday, September 3rd to honor the Navy SEALs killed in action on August 6th, 2011. I registered on the website to participate at Hardass Fitness / CrossFit Hawaii. The WOD was very dear to this box as some of the members knew the service men who died. We even made the local news, KHON2: here and here, and Hawaii VA Loans: here. The 31 Heroes WOD class was scheduled at 10am. There was also a small regular CrossFit class at 9am, but most people showed up for the 31 Heroes WOD. Afterwards, there was a party! 9am crew at CrossFit Ewa Beach! Next on the list of CrossFit boxes on Oahu to checkout was CrossFit Ewa Beach in Kapolei, HI. I really wanted to check it out since it is currently the only CrossFit box on the south-western part of Oahu. Kapolei is intended to be the "second city," or the second urban city next to Honolulu. It took me almost 1.5 hours to get here from Hawaii Kai (35 mi drive)! Oahu traffic has gotten significantly worse since I lived here! Skye in CFO gear. Apparently my dad thought it would be funny to dress the dog up in my clothes. This is my first time home since starting CrossFit in January 2011. 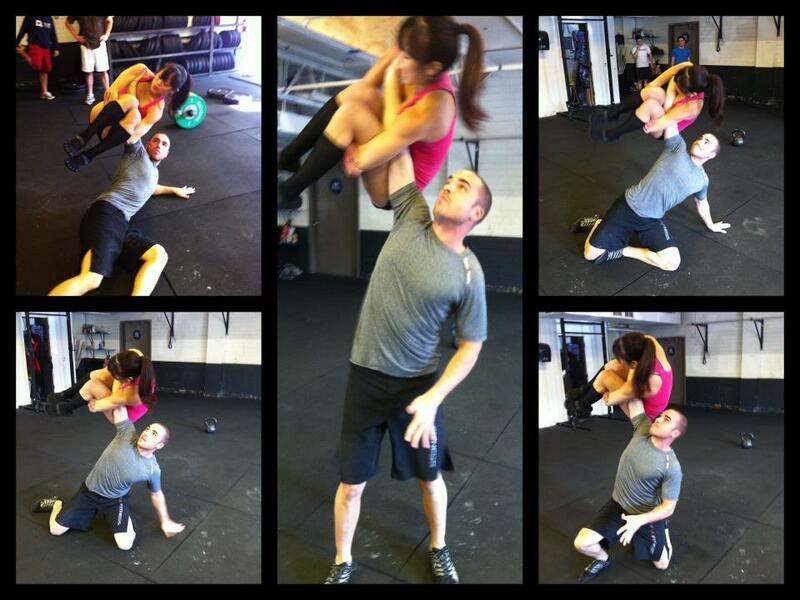 One of the things I wanted to do while home was check out all the CrossFit gyms on Oahu. My first stop was CrossFit Oahu in Honolulu. This box has been around for a long time. 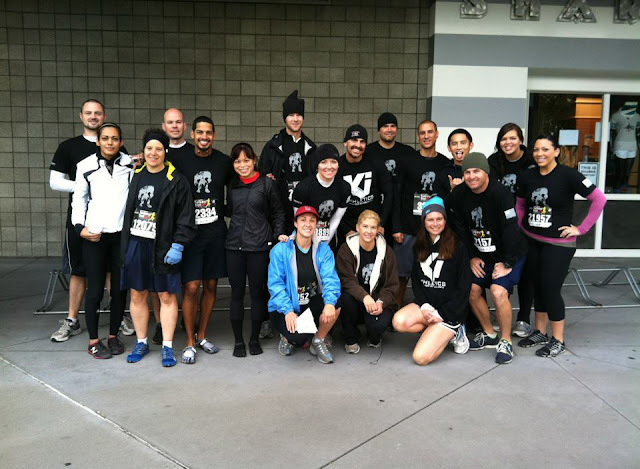 They were around the 50th CrossFit gym to affiliate. I believe they are also currently the largest CrossFit gym on Oahu (by 500 sqft), and possibly in the state of Hawaii, too. I came in a little early to do my 20-rep back squat routine (thank you!) and then stuck around for the 2pm class last Thursday with Courtney Johnson, a CrossFit Level 2 Trainer and Dietitian. It was a small class: 4 people, probably because it is the hottest time of day to workout on the island! I heard evening and morning classes can have 20+ people, but the gym is big enough to handle that and they have a lot of equipment. I have been told many, many times by Jason and by my CrossFit friends to try the Paleo Diet for two weeks straight. I have done all the Googling and all the research to agree that it works. 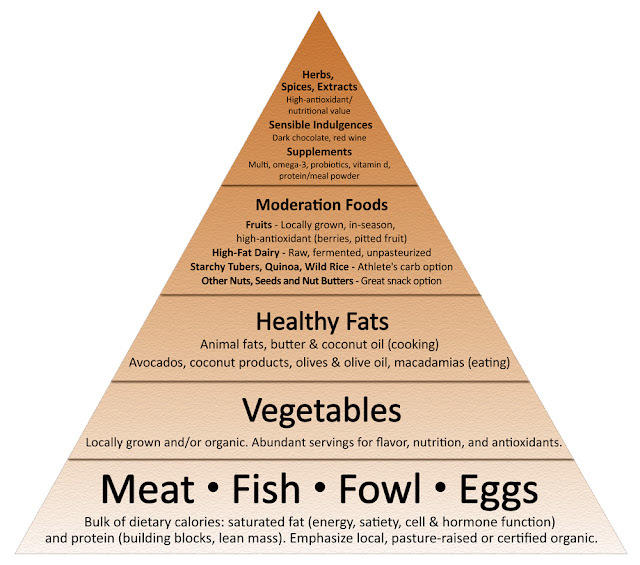 For the most part, I tried (probably not hard enough) to eat clean (avoid refined sugar, grains, and processed food). However, when it comes to food being readily available right in front me, I lose all control. Around the beginning of August, I got sloppier about what I chose to put into my body. While doing CrossFit during the second week of August, I noticed that I my performance was sub-optimal. I scored 50-reps less total on Fight Gone Bad, had a very hard time snatching a comfortable weight, did some of the worst cleans I've ever done in CrossFit, and did not PR on anything (meh not sure if it's related, PRs happen less now). I talked to one of my trainers Rick about it and we went through a checklist. I was getting a decent amount of sleep (~8 hours/night), relatively not stressed, coming into the gym six times a week, but I have been eating terribly. This was probably the first time I noticed a huge change in my performance and therefore I decided to try, at max effort, a strict paleo diet for at least 2 weeks. It is a good time for me to do the challenge since I visit home on September 1st. Truffle Salt, my free food remedy. Sticking to a clean diet has been a huge challenge for me, especially because I am surrounded by free food almost all day, everyday. I am a Software Engineer in Silicon Valley. I have a hard time controlling myself, especially since food is so convenient. For example, if there are jalapeno poppers laying out, all cooked, warm, and smelling delicious, I will start by eating one (hey, it's just one), then two (it's just one more), and then before I know it, I have devoured at least 20 of them. I was in denial for awhile. I claimed that I eat "mostly Paleo," except on binge day, once a week. However, I would "cheat" every few days with a small piece of white chocolate. Few days turned into a couple of days, and then turned into every other meal. Those white chocolate pieces were getting larger and then I was adding ice cream, fried food, rice, and occasionally pasta. All those "cheat" meals added up and soon enough, I had performance issues at the gym. So how does one stay Paleo for more than a couple days straight? What about minimizing fructose temptations? This is what worked for me.